The new high-availability features of Lync Server 2013 present new considerations for the backup of Lync Server data as well. For example, the Front End Pool Pairing feature includes the Lync Server Backup Service, which synchronizes the Lync Back End databases between two Front End pools, including the Central Management Store. For this reason, with some Lync Server 2013 topologies individual backups of SQL databases can be diminished in importance in comparison with previous versions of the product. However, there are still circumstances in which it makes sense to perform a manual backup of the Lync SQL databases. For example, it is always recommended to perform a backup before performing major configuration changes. With that in mind, it makes sense to be familiar with the options for performing this type of backup. There are actually a number of ways to back up the Lync SQL databases, including native Windows Server backup, SQL-based backups that output the data into a flat file, and third-party backup solutions that support SQL. In the following sections, two methods of backing up the Lync Back End databases are detailed, including Windows Server native backup and SQL 2012 native backup. 1. From the Server Manager console, select Local Server in the left pane. 2. From the Manage drop-down menu, click Add Roles and Features. 3. 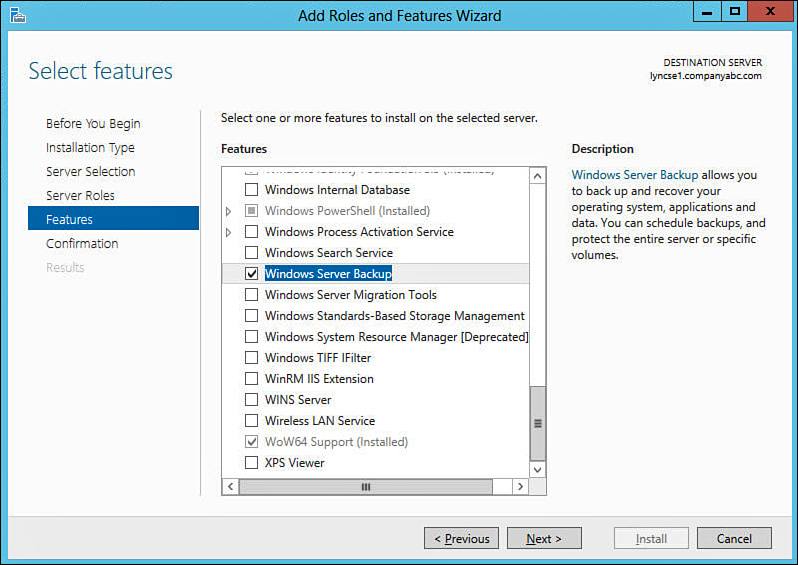 At the Select Installation Type screen, keep the default option of Role-Based or Feature-Based Installation, and click Next. 4. At the Select destination server screen, keep the default option of Select a Server from the Server Pool, and verify that the Lync database server is selected in the Server Pool list at the bottom of the screen. Click Next. 5. At the Select Server Roles screen, click Next. 6. At the Select Features screen, scroll down to the bottom of the list of features and select Windows Server Backup, as shown in Figure 1. Click Next. Figure 1. Adding the Windows Server Backup feature. 7. At the Confirm Installation Selections screen, click Install. 8. When the installation has completed, click Close. 2. From the Tools drop-down menu, click Windows Server Backup. 3. In the Action pane at the far right, click Backup Once. 4. 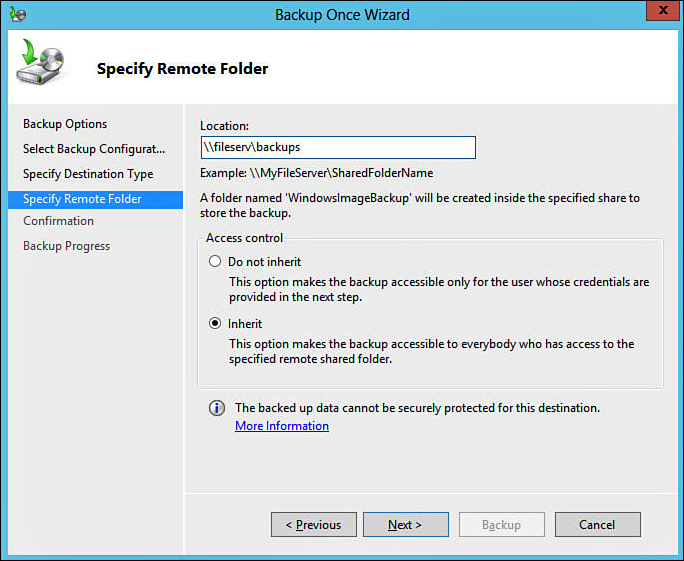 In the Backup Options Wizard, either select Scheduled Backup Options to use previously configured backup settings, or select Different Options to make a backup with new options. Click Next. If this is the first time that Windows Server Backup is being used, the Scheduled Backup Options selection will not be available. 5. At the Select Backup Configuration screen, choose either Full Server or Custom Backup. If Custom Backup is selected, be sure that all volumes containing SQL program files and data are included in the backup item selections. For Lync Server SQL backup purposes, Full Server backup is typically the best choice. After the selection is made, click Next. 6. At the Specify Destination Type screen, select either Local Drives to store the backup file locally, or Remote Shared Folder to store the backup file on the network. Click Next. Windows Server Backup will only allow backups to be targeted to drive volumes that are not selected as part of the backup job. Therefore, unless an external disk is attached to the system that can be used as a target, the Remote Shared Folder option is typically the best choice for destination type. 7. Depending on the selection made on the preceding screen, either the Select Backup Destination screen or the Specify Remote Folder screen is presented. For a local backup destination, choose an available drive volume from the drop-down menu and select whether backup verification will be enabled after the backup file is written. For a remote folder, specify the remote location using the UNC path format, as shown in Figure 2; then in the Access Control section select whether access to the backup file will require credentials. When finished, click Next, which will validate the backup destination. Figure 2. Remote folder backup settings. 8. After the backup destination is validated, review the backup job settings listed on the Confirmation screen, and then click Backup to begin the backup job. 9. After the backup job completes, click Close.